Here’s a question. While walking with a friend in…[Spring Lake Preserve] last week, we saw what seemed to be a new structure. We assumed an illegal deer blind was being assembled. When [my husband] went a few days later, he climbed into it and decided it was a legal observation platform. We figured you would know. Your caution and concern were appropriate; eyes on our parks are so important for keeping them natural. And even more important is having people take a moment to check in to find out what’s going on. [Your husband’s] secondary instincts are correct. 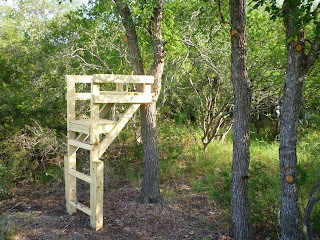 You saw a wildlife observation post constructed by an Eagle Scout candidate for his final project. It is was approved by the Parks and Recreation Department. SMGA consulted…t.o.d.